In order that i might come to a better understanding of the subtleties that i keep being told are implicit in Darjeeling, today I’m brewing a different FTGFOP, namely Fairtraded Organic Ambootia. Ambootia is a tea I’ve sampled two or three times over the past few years, and I’ve consistently enjoyed their handiwork. Ambootia Group (warning: their site has an annoying digital butterfly that pesters you) is a tea conglomerate that oversees ten individual Darjeeling gardens including: Ambootia, Chongtong, Happy Valley, Monteviot, Moondakotee, Mullootar, Nagri, Nurbong, Sepoydhoorah (Chamling) and Sivitar (though I myself only ever heard of Happy Valley and Moondakotee). Ambootia Group is one of the most loving and humane employers in Darjeeling, both in terms of how well they take care of their planters and pluckers (Fairtrade certified), but also in that Ambootia is certified biodynamic, USDA organic (among other certifying bodies) and HACCP and SQF certified to meet stringent international food safety standards. Now that I have a strong understanding of what’s involved in order to meet the requirements of the Demeter Biodynamic certification (eg. putting more back into the Earth than you take out, cultivating more in tune with nature based on the waxing and waning of the moon, changing the focus from profit to improving the well-being of your community, etc. ), I’m thoroughly impressed by Ambootia. That being said, it comes as no surprise that Ambootia Estate FTGFOP stands apart. As opposed to Margaret’s Hope and Steinthal, Ambootia’s FTGFOP has a deeper, rust-colored bronze liquor, indicating I’m brewing a post-Monsoon Second Flush. It’s much more difficult for me to pick out specific notes Ambootia FTGFOP’s nose: the most present scent to my mind is a gentle musk, not unlike a much-loved leather-bound book. I’m also somewhat reminded of my grandmother’s sewing room, though i have no idea why. In flavor, Ambootia FTGFOP is really quite different from its Darjeeling cousins. A clean, homogenous Indian Black, dank and clever like an Assam, but lacking an assamica curl, Ambootia FTGFOP has a more old leather taste and reminds me of a peeling suitcase i once had as a child. In texture, Ambootia FTGFOP is also smoother/less-harsh on the tongue than other Indian Blacks. What grit I can find is more jagged and charcoaly than I’d have thought. Ambootia FTGFOP would make a strong candidate for the “Darjeeling” component in an English Breakfast blend… Which is a little odd since it’s a full-leaf orthodox, rather than a cut-tear-curl. I’d say by virtue of having been grown biodynamically, Ambootia FTGFOP will probably end up being the most impressive tea I review this week. 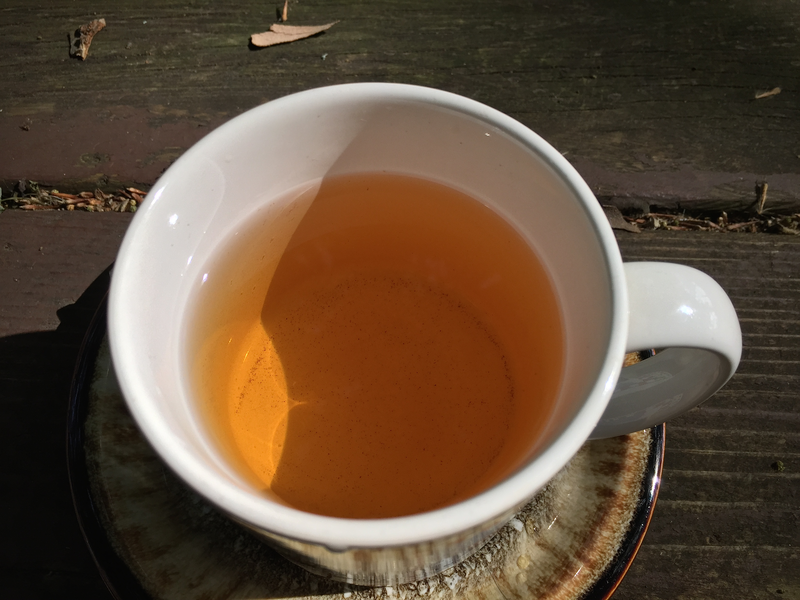 Yet, in terms of how my rating scale is setup, Ambootia FTGFOP would probably make for a good introduction to the field of Darjeeling Fine Tippy Golden Flowering Orange Pekoe, but hardly a contender for the crown. Mean score – 92% Despite some reservations (especially in terms of price), Ambootia Fair Trade Organic FTGFOP makes a strong showing. Ambootia Estate FTGFOP Liquor by Jocilyn Mors is licensed under a Creative Commons Attribution-ShareAlike 4.0 International License.